BELLVILLE — A building that mostly gets passed by without a glance, is quickly being transformed and is becoming a center of attention in the downtown area. The old Bellville Elementary School building is starting to show its familiar shape on a building in an alley behind the Mechanics Bank building. You can see the artist, Robin Shoup Wilson, if the weather happens to be just right at work. The project is associated with Mankind Murals, of Mansfield. Wilson said when she was consulted about doing the project she eagerly said yes. “I love what I’m doing,” she said. Wilson has done other murals, including one for Fork and Fingers Restaurant in Mansfield. She also did one for the new Jefferson Township Bellville Fire Department outside of town on State Route 13 South. The new mural will show the original Bellville Eementary School building, with trees growing near it. Doing the project has been a slower-than-expected process because of recent rains. Wilson said she hopes the project will be mostly done by the time of the Bellville Street Fair in September. 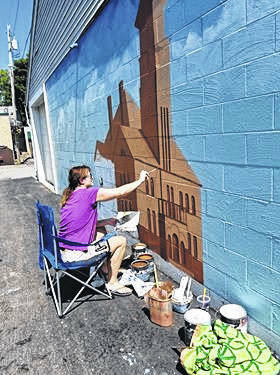 Wilson is a 1985 graduate of Clear Fork High School, and says she is a “self-taught” artist. Doing this kind of mural requires use of exterior paint. She said she uses a paint and primer combination, and a sealer will be applied if necessary. Wilson admits she can’t predict the exact completion date. “We live in Ohio,” she said. She said it will be “potentially” be done by the fair, or at least three fourths complete. New construction is “steel and glass and concrete.” She said she hopes parts of the old school building will be salvaged. Wilson, 51, has two sons, 17 and 19. She lives in Loudonville. Her normal day-time job is cleaning houses for a group of long-time customers. Many artists sign their works, but she said she is unsure about whether to sign the piece she is creating. She said she is “attached” to this area, and because she is working on this effort alone, she will probably sign it. Other art works are on the list of things to be done in Bellville. Crosswalks in the village will also be painted. They will have Bellville, Ohio spelled in a script font. There will also be a rendering of the bandstand in Central Park. Luke Beekman, of Mankindmurals.org said two crosswalks are scheduled to be done. The budget for the mural and two crosswalks is $2,025, said Beekman. An amount of $675 is for the crosswalks and $1,350 for the school mural, he said. She recently had an art show at Phoenix Brewing Co. in Mansfield. It included portraits of music legends. On Oct. 12 there will be another show at Electric Co. on Fourth Street in Mansfield. Other artists — totaling about 30 — will participate in that event. Wilson said she also wants to do an event next spring, where Motown artists will be recognized. She said her efforts are so popular bands are coming to her so they can participate.